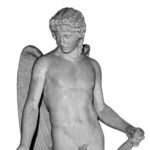 Perseus was one of the oldest out of all of the Greek mythological heroes. 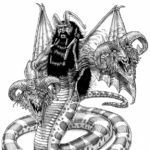 He is best known in Greek mythology as the slayer of Medusa, one of three female creatures, or Gorgons, with hair said to be made of poisonous snakes. Perseus was thought to exist several generations before the famous Heracles (Hercules). He was born to Danae, his mother, who was a mortal (meaning that she was not a God). 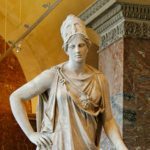 Danae was the daughter of the king of Argos, King Acrisius. King Acrisius had once sought advice from the oracle at Delphi because he had been unable to have a son. In Greek mythology, oracles were like fortune tellers and Acrisius was seeking information for his future. The oracle told King Acrisius that he would one day be killed by his daughter’s son. King Acrisius was determined to keep that from happening, so he decided to lock up his only daughter, Danae. According to the legend, she was imprisoned in a bronze enclosure (some versions of the story say that it was a tall bronze tower, other versions report that it was actually an underground prison that was open to the sky). His goal was to keep her from male suitors so that she could not become pregnant. 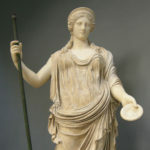 The myth goes on to say that through the opening in her enclosure, the great God Zeus came to her in a golden rainfall. From that meeting with the very amorous Zeus, Danae did become pregnant and had a child while still imprisoned. That child was the legendary Perseus. 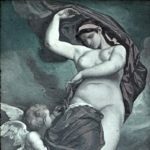 Thus, Perseus was known as a demigod, meaning that he was born of both mortal (his mother, Danae) and immortal (his father, Zeus) parents. When King Acrisius realized that his daughter had, in fact, had a child, he feared for his life, but was unable to take the lives of his daughter and grandson. Instead, he responded by locking Danae and Perseus in a wooden chest and casting them out to sea. Perseus and his mother, Danae experienced calm seas after being cast out of Argos. The legends say that Zeus played a role in that by speaking to Poseidon, the God of the sea, so that they may have a calm journey. Eventually, Danae and Perseus washed up onto the shores of the island of Seriphos, an Aegean island. There, they were found by a fisherman called Diktys. He proceeded to help raise Perseus on the island of Seriphos. Perseus spent many years at Seriphos. He was known there as a young man with great physical strength as well as great courage. Danae stayed there as well. She happened to catch the eye of the brother of Diktys, who was also the King of the island. His name was King Polydectes. The King wished to court Danae, but Perseus did not want that for his mother and he therefore became an obstacle for the king. King Polydectes needed a way to rid himself of Perseus so that he could get to Danae. Perseus was eventually overheard boasting about his physical strength, saying that he could single-handedly kill the dreaded Gorgon Medusa. This was the opportunity that King Polydectes was looking for. 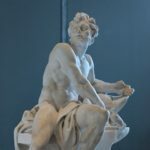 He presented a challenge to Perseus that if he could not make good on his boast to kill Medusa, then the King would take possession of his mother. With the challenge from King Polydectes, Perseus was started on a mission to slay the Gorgon Medusa. Medusa was one of the three Gorgons, sisters who were known for their hair made of venomous snakes and who could turn men to stone with just a single look. Medusa was the only one of the Gorgons who was mortal (meaning that she could be killed). Perseus first consulted the Gods, who advised him to seek out the Graiai. The Graiai were actually 3 other sisters of the Gorgons. The myth states that the Graiai were three old witches who had only one tooth and one eye between them. 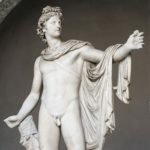 Perseus was said to have stolen the eye and would only return it for information on finding Medusa and also information on finding the cap of Hades (a cap that made the person invisible when he wore it) as well as winged sandals to enable him to fly. He also asked for the kibisis, a special bag that he would use to carry the head of Medusa. In order to get their eye back, the Graiai gave in and helped Perseus to find the items he asked for. 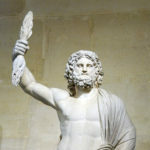 With those items as well as a sickle given to him by the God Hermes, Perseus was on his way to attempt to slay Medusa. The Gorgon Medusa, along with her sisters Sthenno and Euryale, were said to live at the ends of the Earth beyond the oceans. Perseus was able to fly to their lair thanks to his flying sandals that he now had. Using the cap of Hades to render him invisible, he was able to find and silently slay Medusa with the sickle that he received from Hermes. In addition to killing Medusa, this event was said to be the birth event of Pegasus, the mythological winged horse, and his brother Chrysaor, who were said to have emerged from the severed neck of Medusa. Upon slaying Medusa, the other Gorgon sisters were alerted and tried to subdue Perseus. 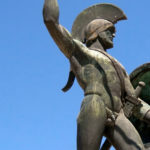 However, the God Athena assisted Perseus with fleeing and he was able to escape with the head of Medusa in the kibisis. Perseus was triumphant in his quest to kill the Gorgon Medusa. While on his journey back to the Island of Seriphos where his mother awaited, he came across the beautiful Andromeda. 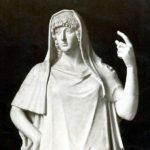 The legends say that Andromeda was the daughter of Cepheus and Cassiopeia, who were the king and the queen of Ethiopia. 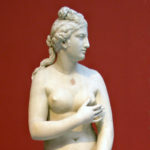 Cassiopeia had bragged about Andromeda’s beauty, saying that she was more beautiful than the Nereids. The Nereids were sea nymphs, or female spirits of the sea. Poseidon, being the God of the sea, was angered by the boasting of Cassiopeia. Out of his anger, Poseidon sent a great flood to Ethiopia. He also sent a sea monster to wreak havoc on the territory. It was said that the only way to appease Poseidon was to offer up Andromeda as a sacrifice to the sea monster, and so that was done. Andromeda was kept chained to a rock by the sea monster, which is where she was first seen by Perseus as he journeyed back from Medusa’s lair. Perseus immediately fell in love with Andromeda. In order to marry her, he offered a trade to Cepheus, the King. He would slay the sea monster that was terrorizing the kingdom and in return would take Andromeda’s hand in marriage. The king accepted the deal. Perseus easily slayed the sea monster using the weapon that he carried in his kibisis: the slain head of the Gorgon Medusa. One look at Medusa and the sea monster was turned to stone. The head of Medusa also brought about another casualty. 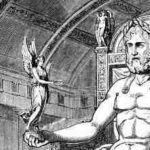 Phineus, who was the brother of King Cepheus, also wanted to marry Andromeda and claimed that she had been promised to him. He decided to claim Andromeda for himself and stood in the way of her union with Perseus. Perseus again used Medusa’s head to defeat his competition, turning Phineus to stone just as he did the sea monster. After his victorious defeat of Medusa and his marriage to Andromeda, Perseus continued back to Seriphos where his mother awaited. Upon his return, he quickly learned that King Polydectes had been abusive to his mother Danae while he was away on his quest. 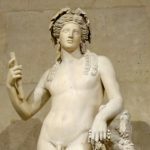 Infuriated, Perseus brought the head of Medusa to the king, but instead of just giving the severed head to Polydectes, he again used it as a weapon against his foe. Showing the king the head of Medusa gave him the same fate as Poseidon’s sea monster and Phineus. This, in turn, made Diktys, the fisherman who raised Perseus, the new king since he was the brother of Polydectes. 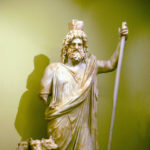 Finally, Perseus would be rid of Medusa’s head when he presented it as a gift to the God Athena. The myths say that Perseus eventually returned to Argos with Danae and Andromeda. King Acrisius had gone to Larissa in Greece, probably to avoid Perseus. However, Perseus went to Larissa in search of his grandfather. 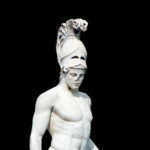 Perseus was, of course, known as a great athlete with tremendous strength. Upon arriving at Larissa, he found that there were funeral games being held there. He joined in the games and participated in a discus throwing event. As fate would have it, Perseus threw a discus which went off track and into the crowd. The discus hit and immediately killed King Acrisius, thus fulfilling the prophecy of the oracle at Delphi so many years before this event. 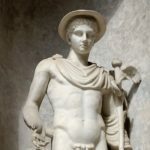 After causing the prophesized death of his grandfather Acrisius, Perseus was noted to be ashamed to take the kingdom for his own. Instead, he offered the kingdom of Argos to Megapenthes who was his uncle and the ruler of Tiryns. In exchange, Perseus would become the ruler of Tiryns. From there, it is said that Perseus went on to form the Kingdom of Mycenae. The legends vary on this part of his life, just as there are variations to the other stories of his life. A popular story is that he did take up residence there as King along with Andromeda. After years of ruling over the kingdom of Mycenae, he died of old age. 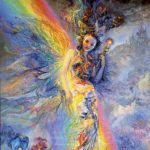 Since he was a loyal servant to the Greek mythological Gods, he was placed in the skies among the skies along with Andromeda and Cassiopeia and has remained there forever. 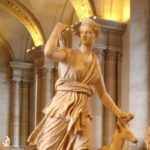 In Greek mythology, various old texts are used as references along with centuries old artifacts and drawings. Many variations of the old stories have been told. For example, in one version of the story of Perseus, the oracle’s prophecy was fulfilled when Perseus showed Medusa’s head to Acrisius to prove that he had actually slain her. This, of course, would have killed Acrisius and still fulfilled the prophecy. • Perseus was the son of Danae and had a mortal father, Danaos, but was believed to actually be the son of Danae and Zeus. • Perseus was one of the oldest of the Greek heroes, predating Heracles (Hercules) by three generations. 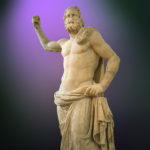 • Since Zeus was thought to have fathered both Perseus and Heracles, that made Perseus the great grandfather of Heracles . . . but also his half-brother! • King Acrisius was afraid of his fate because an oracle said he would be killed at the hands of his future grandson (which would turn out to be Perseus). • To prevent having a grandson, Perseus imprisoned his own daughter, Danae in a bronze enclosure (either a tower or an underground enclosure). • The God Zeus fathered Perseus when he had relations with Danae even though she was locked away. • King Acrisius sent Danae and Perseus away at sea locked in a chest out of fear for the oracle’s prophecy. • Perseus was raised by a fisherman, Diktys, on the island of Seriphos, where he was eventually challenged by the King of Seriphos to slay the Gorgon Medusa. 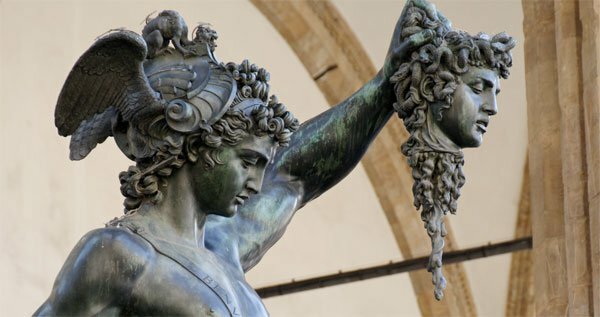 • Perseus stole the eye of the three Graiai in order to convince them to give the location of Medusa as well as items used to slay her: the invisibility cap of Hades, the kibisis to carry her head, and winged sandals to enable him to fly. • After killing the Gorgon Medusa and escaping from her two immortal sisters, he found Andromeda on the journey back. • He eventually wed Andromeda after rescuing her and slaying Poseidon’s sea monster. He also had to kill Phineus, another suitor of Andromeda, in the process. • Upon returning to Seriphos, Perseus found out that his mother, Danae, was forced to hide from the King of Seriphos because of his abuse of her. Perseus presented Medusa’s head to him, killing him with her stare. This resulted in Diktys, the fisherman who raised Perseus, becoming the new king. 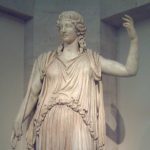 • Although there are differing stories as to how it happens, the oracle’s prophecy is eventually fulfilled by the death of King Acrisius at the hands of Perseus after he returns to Argos and then to Larissa, either by accidentally striking him with a discus or by showing him Medusa’s head to prove that he had slain her. • Perseus eventually reigns over Mycenae with Andromeda and dies of old age (at least in one version of the myth)! • Perseus has been falsely associated as being a rider of Pegasus, the winged horse. It was a Greek hero, Bellerophon, who tamed and used Pegasus in battle. The association of Perseus with Pegasus involves the beheading of Medusa which set forth the first appearance of Pegasus.